Your home is your shield. It is your most sacred place and for some, it is equivalent to their life’s work. 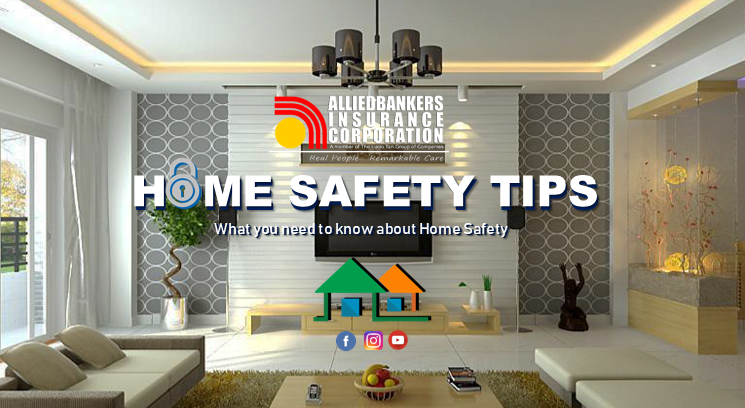 So, allow ABIC to give you some useful tips on how to take care of your home. Based on statistics, faulty electrical wiring is one of the top reasons for fire incidents. Never forget to replace or change frayed wiring, defective electrical fixtures and damaged sockets immediately. If there are lights flickering or the smell of burning rubber in your home, then that is not a good sign. Most houses use extension cords so they can plug several appliances and devices all at the same time. However, this is not a good practice as it may cause the sockets to overhear and cause a fire. Big household appliances such as air conditioners and refrigerators should have their own designated outlet. Lastly, do not forget to unplug appliances that are not in use. This has been said countless times before but it always pays to listen. Always place anything flammable in high places. Your tanks should always have a safety cap and security seal. Make sure that you use the right hose and that the regulator is attached securely to the cylinder valve. Sometimes, there is nothing more relaxing than to have the aroma of a scented candle filling your home. However, it is always best to place it in an area where kids and pets wouldn’t be able to knock them. Also, keep it away from items that can easily catch fire like curtains, books and papers. So there you have it. We hope that the following tips will be useful for you in keeping your home safe. But on top of this, the best protection and safety you can get is to have your property insured. Get the best property insurance from a company that is RELIABLE, REPUTABLE, RESPONSIVE and INNOVATIVE. Get your insurance from the best. Get it from ALLIEDBANKERS INSURANCE CORPORATION!